Terrence Chapman is an associate professor of Government at the University of Texas at Austin. His work spans the areas of international organizations, international conflict, and international political economy. He is a distinguished scholar of the Robert S. Strauss Center for International Security and Law and affiliated faculty member of both the Center for European Studies and the Clements Center on History Strategy, and Statecraft at the University of Texas. In 2009-2010 he was a visiting associate research scholar at the Niehaus Center for Globalization and Governance at Princeton University. His work has appeared or is forthcoming in International Organization, the Journal of Politics, the British Journal of Political Science, the Journal of Conflict Resolution﻿, the Journal of Theoretical Politics, International Interactions, and International Studies Quarterly. 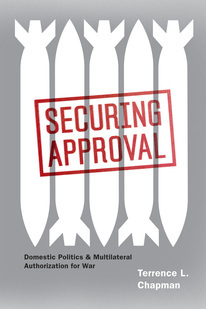 His book, Securing Approval: Domestic Politics and Multilateral Authorization for War, was published by the University of Chicago Press in 2011 and won the 2011-2012 American Political Science Association Conflict Processes Section Book Award. He is a former associate and senior editor for International Studies Quarterly. He received his Ph.D. in 2007 from the political science department at Emory University.